Stress fibers are contractile in nature. By exerting and maintaining tension on the underlying substratum, they form a key element of the mechanotransduction apparatus that links the cell interior and exterior. The organization of stress fibers resembles the alternating thick actin filaments and Z bands in muscle myofibrils, however, the actin and myosin filaments in stress fibers are less regular when compared to myofibrils  and they do not contract uniformly along their lengths . 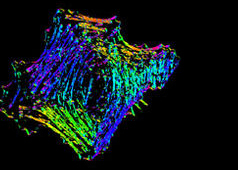 Stress fibers in slowly migrating cells, e.g., bone cancer cells (left) and fibroblasts (right). B. The presence of myosin thick filaments in stress fibers and transverse arcs makes them contractile. C. Dorsal/ventral stress fibers are anchored to the external surface through the focal adhesions. Assembly of over 165 component molecules into the FA is modulated by internal forces from the contraction of myosin and actin filaments in the stress fiber, or external forces generated on ECM components. Similar to muscle cells, the myosin motor proteins hydrolyse ATP and their coordinated movement along the complex of actin filaments causes the filaments to slide past each other, which translates into shortening or contraction of the stress fiber by as much as 20% . Cell-generated tension allows stress fibers to stabilize the cell structure, produce force, and transduce mechanical information about the composition of the cell exterior to drive changes in cell shape, migration, and ECM remodeling (reviewed in ). Stress fibers appear to contract continuously with occasional relaxing or stretching; this contraction force is mediated by a class of non-processive, ATP-dependent myosin motor proteins . 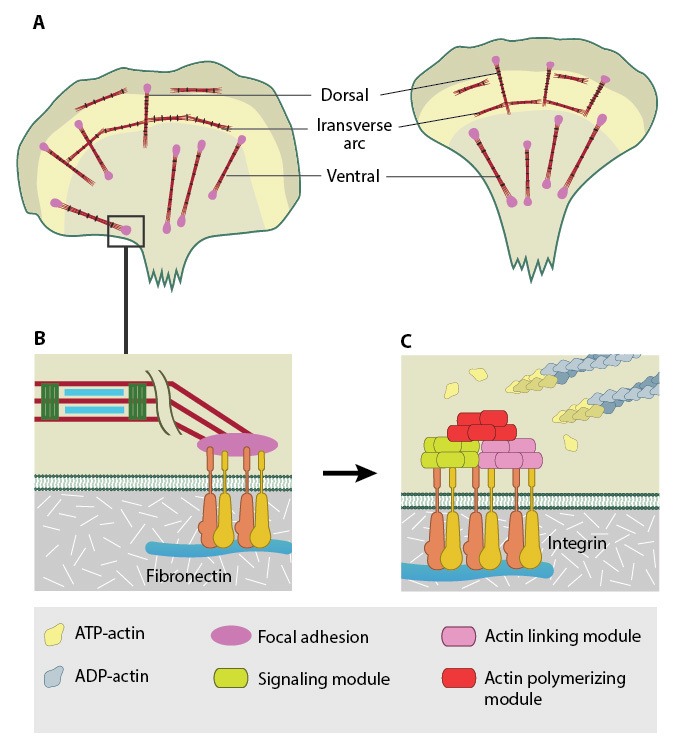 ATP hydrolysis allows the myosin protein to undergo a conformational change that results in the movement of the actin filament relative to myosin in order to generate force. Each ATP hydrolysis allows a displacement of 5-25 nm , however, it is important to highlight that stress fibers require anchorage in order to exert this force. Stress fibers are linked at either end to the cell exterior by a large assembly of proteins known as the focal adhesion (FA). Both traction forces and resting tension that are produced by the contraction of the stress fibers are fundamental for force generation and are essential for regulating cell shape, adhesion and motility . Not surprisingly, stress fibers are less evident in actively migrating cells. 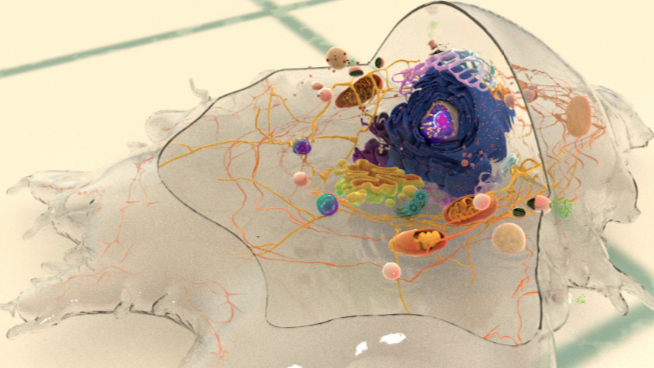 In line with this observation, when a cultured fibroblast is removed from the substratum, it adopts a spherical morphology, coupled with the disappearance of stress fibers. When the cell is returned to the substratum, the stress fibers reappear within hours. Stress fibers are rarely observed in cells and tissues in vivo, thus many groups claim that stress fibers are an artefact of in vitro artificial culture. However, recent studies demonstrated that stress fibers play an important role in vivo: for example, in the closure of epithelial sheets during embryogenesis, in contraction of myoepithelial cells around many epithelial ducts, and in endothelial cells of blood vessels . Furthermore, muscle cell myofibrils form from stress fiber like precursors during myofibrillogenesis . The mechanisms of stress fiber assembly differ amongst the different types. Stress fibers may be generated through the condensation of small filament fragments, reorganization of pre-existing stress fibers and graded polarity bundles, or by de novo polymerization of actin filaments (reviewed in ). One stress fiber type may also convert into another; such is the case when dorsal stress fibers and transverse arcs are converted into ventral stress fibers . Each type of stress fiber may interact with other stress fiber types, and the steps in their formation may involve the same molecular processes.